Two identical metal blocks of mass 20 kg and specific heat 0.4 kJ/kg are at an initial temperature of 50 degree Celsius .A reversible refrigerator receives heat from one block and rejects heat to the other. Find the work required by the refrigerator to cause a temperature difference of 150 degree Celsius between the two blocks. Mass of each block (m)= 20kg. Specific heat of each block (c)=0.4 kJ/kg. 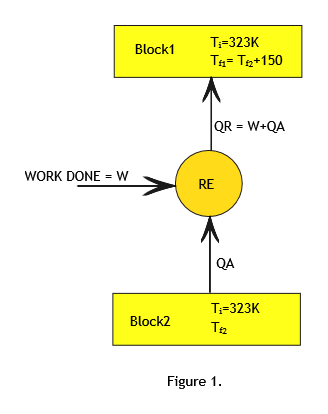 Initial temperature of both the blocks is same (Ti)= 500C=323K. 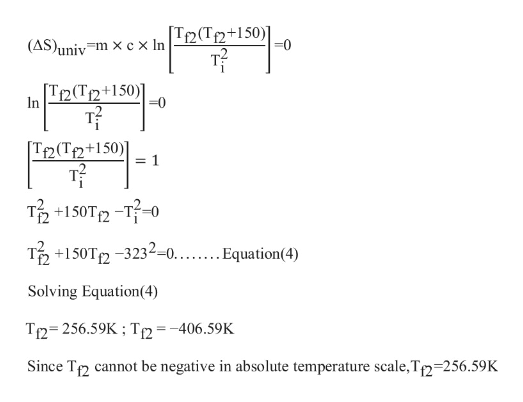 Since heat is absorbed from block2 and rejected to block1 ,Tf1 > Tf2 and it is given that Tf1 - Tf2 = 150. Since the refrigerator is reversible refrigerator all the processes involved are reversible processes. According to Principle of entropy, for reversible processes change in entropy of the Universe is zero. WD= 800 – 531.28 = 268.72kJ. Refrigerator consumes 268.72kJ of work to cause a temperature difference of 150 Degree Celsius between the two blocks.